ProAc Response D40/R review | What Hi-Fi? We could stretch this out a little, but we won’t: the ProAc Response D40/R speakers are wonderful. So there you have our verdict. Want to know more? OK then, these are speakers to judge in a listening room – not on technology content or specification. 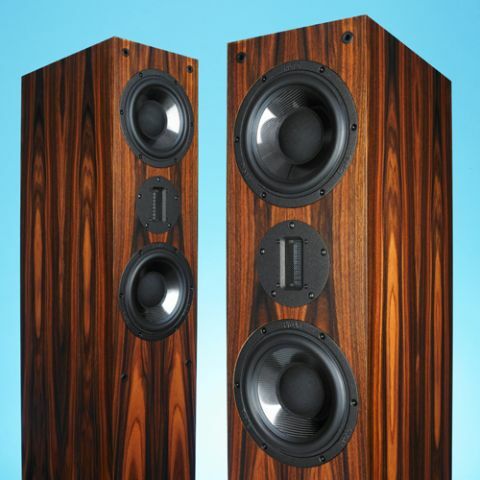 As with almost every ProAc speaker we’ve reviewed it’s not as if the technical ingredients suggest anything special. A rectangular MDF cabinet and dual 16.5cm carbon-fibre mid/bass drivers don’t exactly get the heart racing, though the inclusion of a ribbon tweeter sparks our interest just a little. As always, it’s the details that make the difference between ordinary and extraordinary. That cabinet might be a conventional MDF box, for example, but it’s very solidly made and immaculately finished. Our review sample is clothed in a lovely rosewood veneer. This takes the price up to £7350, as would the equally attractive ebony option. A hefty increase no doubt, but such is the quality of the standard finishes – you have a choice of cherry, maple, mahogany and black ash – we wouldn’t necessarily feel the need to pay the premium. The cabinet features a downward-firing reflex port arrangement where the port exits into a gap between the base of the cabinet and a plinth. The idea behind this is to get the port to drive the air in the room in a more consistent manner, making the speakers less fussy about placement. Those carbon fibre-coned mid/bass drivers are ProAc’s own design. It’s something of a rarity for such a small manufacturer to have its own drive units, as most rivals buy drivers from outside suppliers. ProAc’s engineers put in a lot of effort to get the cone just right – the weave and type of carbon fibre used make a great deal of difference to the final results. The ‘R’ in the speakers name signifies that it has a ribbon tweeter. This is a 6x1 cm unit, and is chosen for its resolution and transparency. There is also a soft dome equipped version of this speaker, simply called the D40. It’s available for around £250 less, but the ribbon version is the one that sells the best. At 120cm tall the Response D40/Rs are big speakers, which need a decently large room to makes sense both visually and sonically. As expected, they sound best when given plenty of room to breathe. That unusual port arrangement works well, though, and beyond needing a decent amount of space they aren’t particularly fussy about their position in our listening room. Just angle them towards the listening position – there’s the usual compromise between sound stage width and image focus to balance – and off you go. The tweeter’s horizontal dispersion is wide, so getting good results should be easy. Keep that ribbon at ear height, though; it has quite a narrow vertical dispersion so it pays to take care in this respect. Electrically, there’s little here that will worry any decent amplifier. These floorstanders are pretty sensitive at 90dB/W/m, so highish volume levels from relatively low powered amps are possible. We’d go the high-powered route, given the choice. The Response D40/Rs are capable of huge dynamic swings and massive volume levels, so it would be a shame not to use these abilities to their full extent. Once we heard old favourites such as the Inception OST delivered with such blood and thunder it’s hard to do without. That said, these speakers have no trouble casting a spell at lower volumes too. Some folk might prefer a more forward and attacking sound, but for us these ProAcs, despite a slightly sweetened presentation, lose none of the drive or excitement of The Dead Weather’s 60 Feet Tall. The speakers’ rhythmic precision is good, and the interplay between instruments is handled brilliantly. There’s an exceptional level of transparency here, coupled with a superb level of detail resolution. Changes in the system from tweaking the equipment supports through to swapping the speaker leads are revealed in a clear and unambiguous manner. Impressive. These towers have the insight to take apart a track as complicated as Radiohead’s 15 Step, but they never sound overtly clinical, preferring to push the music’s message to the fore instead. It’s very hard to make a speaker that goes deep in the bass and still sound fast and exciting. ProAc, however, has managed it. Despite their massive bass slam the D40/Rs remain brilliantly agile, from the lowest notes upwards. Listen to Nick Cave’s Push the Sky set and it’s the clever lyrics, subtle rhythms and beautiful melodies that grab the attention, rather than hi-fi considerations such as bass grip or spaciousness. The seamless integration between the trio of drive units means vocals are as articulate and naturally expressive as you like. If you want to analyse the recording or the performance it’s easy enough, but the ProAc's presentation strongly suggests that the actual music is far more important. We like that. Get the speaker position just right and stereo imaging is very good: the D40/Rs deliver a huge soundstage populated by beautifully focussed images. The image is carefully layered and in proportion, which is not always the case even at these price levels. We’re really taken with the Response D40/Rs. They do the hi-fi things really well but they also have a pleasing habit of getting out of the way of the music. With the ProAc D40/R speakers in our reference system, we invariably ended up thinking how much fun we were having listening, rather than how great the hi-fi was. Oddly enough, only great hi-fi can do that.